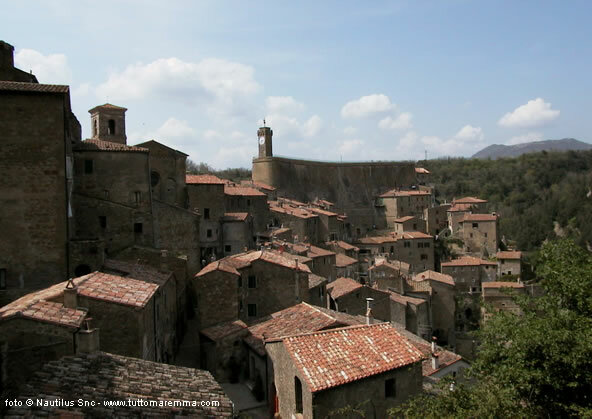 Sorano: a travel guide to the village of Sorano, hotels, farm holidays, holiday homes, accomodation, photo gallery. Sorano is a picturesque medieval village, located on a speer tuff spur surrounded by a flourishing and unspoiled wood vegetation. This very special position gives visitors the opportunity to walk through the village and admire unexpected and beautiful landscapes as they look over the cliff. Sorano has preserved its typical medieval architectural structure, so you can still find where tortuous alleys, narrow streets, courtyards, portals and cellars dug into the tuff. On the top of the tuff the imposing Orsini fortress represents one of the most important preserved examples of military architecture in Maremma. Let us remind you that in the surrounding areas there are many archaeological sites which testify to the ancient presence of Etruscans.